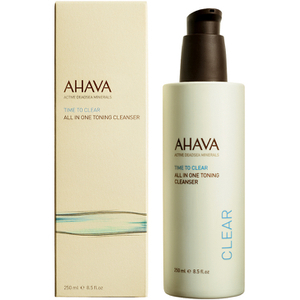 Experience a 3-in-1 cleanse with the AHAVA All In One Toning Cleanser, a mineral-based cleanser that effectively cleanses, tones and removes makeup from the face and eyes. Enriched with a host of vitamins and antioxidants to refresh and protect skin, the toning cleanser expertly eliminates dirt, makeup and impurities whilst helping to refine the appearance of pores with its dose of rebalancing Witch Hazel. The botanical blend is lightweight and comfortable on skin and leaves the complexion looking clean, soft and toned. Free from SLS, alcohol and parabens. Apply a small amount to cotton pad gently wipe over face and eyes. Wipe with a cotton pad. No need to rinse. Use daily. Not to be used for children under 3 years of age. Aqua (Mineral Spring Water), Isohexadecane, Cyclomethicone, Propanediol(Corn derived Glycol), Hamamelis Virginiana (Witch Hazel) flower Water, Sodium Lauroyl Glutamate, Phenyl Trimethicone, Peg-40 Hydrogenated Castor Oil & Propylene Glycol & Trideceth-9 & Aqua (Water), Acrylates\C10-30 Alkyl Acrylate Crosspolymer, Aminomethyl Propanediol, Allantoin, Parfum (Fragrance), Iodopropynyl Butylcarbamate & PEG-4 Laurate & PEG-4 Dilaurate & PEG-4, Methylisothiazolinone, Maris Aqua (Dead Sea Water), Dunaliella Salina Extract & Hydrogenated Polydecene, Glycerin & Phoenix Dactylifera (DATE) Fruit Extract.